Creative moms are always looking for fun new ideas for their kids’ birthday parties. One popular idea is to use 100% silicone wristbands as part of the celebration. All wristbands from AmazingWristbands.com are made of comfortable, latex-free, and non-allergenic silicone. You can create perfect wristband for your child’s birthday party. Start to design your own custom silicone bracelet now! Here are some ideas about how you can use kid’s birthday party wristbands. Give away kid’s birthday party wristbands as party favors in gift bags. 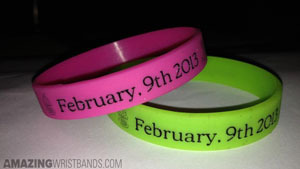 Make a custom wristband that will serve as part of the birthday party invitation, with the date of the party. Create different colored wristbands to designate teams that will participate in party games. Choose glow-in-the-dark wristbands for sleepover parties. Use fun effects such as glitter or swirled colors to make your kid’s birthday party even more fun. We also offer super popular slap bands that “snap” to a person’s wrist, as well as thin half-inch bands, thicker one-inch bands, adjustable bands, USB bands, silicone rings and silicone key chains. Add custom artwork to your wristbands to match the theme of your party. Make sure your kid’s birthday party wristbands are made of 100% silicone to ensure none of your guests has a severe allergic reaction to latex that may be in other, cheaper bands. Why Buy Kid’s Birthday Party Wristbands from Amazing Wristbands? 100% Silicone Wristbands for your kid’s birthday party wristbands. 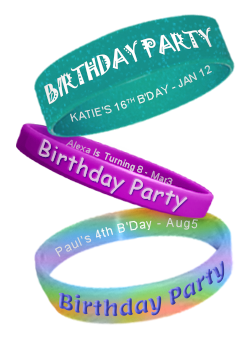 FREE Shipping for kid’s birthday party wristbands in the U.S.
FREE artwork and design for your kid’s birthday party wristbands. FREE Color Matching – choose from one of our many colors! Create your kid’s birthday party wristbands online! I want to know if you have wristband around 4" or 5". I'm looking to get wristbands made for a 30th birthday party for about 40 people. I'm thinking black with white writing and maybe some gold glitter. Can you give me a price estimate? Also, would it be possible to get them by 8/16?